Fourteen years old Suman used to go to school, but three months ago he had to drop out owing to failing health caused by arsenic poisoning. His left foot was amputated four years ago due to gangrene, while both his palms show symptoms of decaying with pus. There are blisters all over his hand and body which doctors diagnosed as arsenic poisoning caused by drinking of contaminated water for more than 10 years. It is taking him to the terminal stage of the poisoning. All six members of Suman's familiy, from a small village of Boro Hossainpur of Jairtuli union in Begumganj, Noakhali, are suffering from similar poisoning but Suman is the worst affected. They drink water from a neigbouring hand-pumped shallow tubewell, which has arsenic many times the level (0.05 mg/L) permitted for human consumption. Suman is among the thousands of inhabitants in Begumganj where survey shows over 90 per cent hand-pumped shallow tubewells used for lifting drinking water are contaminated by naturally occurring arsenic in groundwater. Most of the contaminated tubewells have been sealed off to avoid further health hazard, but Suman and his neighbours still drink from the same tubewell that cost his foot. As part of the routine tubewell distribution by the lone government agency, the Department of Public Health Engineering (DPHE) safe tubewells have been allocated to the affected population through local NGOs. Unfortunately, Suman is not on the list of the affected and uncared-for due to what many people view as an ineffective policy of the government. To receive a tubewell, the beneficiaries must make an advance payment of 10 per cent of the total costs of the tubewell. On an average the beneficiary--usually a group of about 50 people-- has to pay Tk 4,500 in advance, and only then installation would begin at a site selected earlier for convenience of all the participants. It has a target of bringing 1.3 million people in the coastal districts under safe drinking water coverage by June 2005 and half its target has already been achieved, claimed the officials. But in reality the picture is different. Suman cannot even apply for a government sanction for a tubewell because his unemployed family members cannot afford to make advance payments. There are many such 'poorest of the poor' families which badly need safe drinking water but have no money to participate in the process of installing a DPHE-supplied tubewell. Asked how the affected poor people like Suman's family could get tubewells, regional coordinator of the DAM Md Asaduzzaman said, "We are helpless. It is the policymakers who decide and we simply execute the plans. We cannot even ask the beneficiaries to pay the money later since we have to strictly follow the rules." According to Alamgir Hossain, an official of the Association for Community Health Services, a partner of the DAM, those who are not able to pay are not selected as a member of the beneficiary group. "We choose only those who can pay the full amount of Tk 4,500." 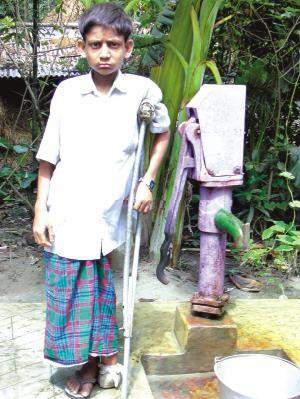 Schoolboy Suman's left foot was amputated due to gangrene caused by arsenic contamination, which has now affected his entire body. Source: The Daily Star, Front Page, Sat. June 21, 2003 .